Ivory #5 Coil - 30"
Home > SEPARATING or JACKET > Ivory #5 Coil - 30"
#5 Nylon coil, polyester tape zipper. Easily shortened for any length hoodie or jacket. 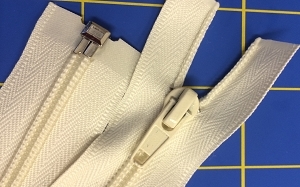 If you need to shorten this zipper, order 2 Top Stops for #5 zippers. The top stops keep the pull from running off the top of your zipper.